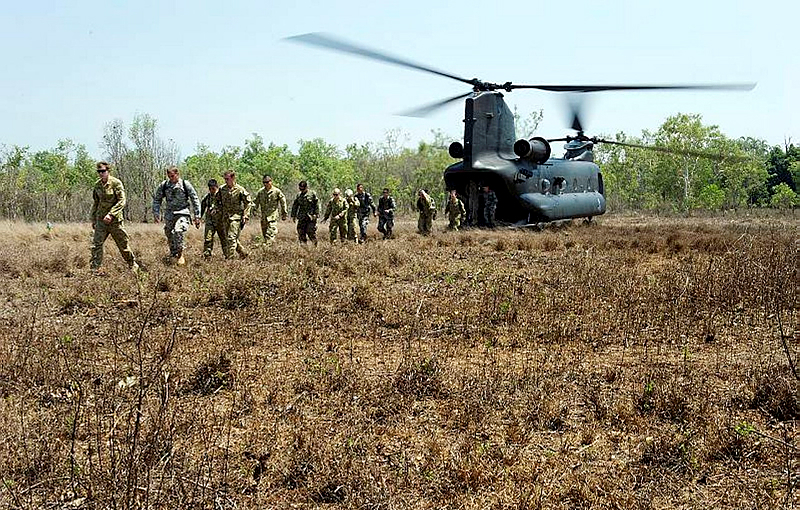 Northern Australia: how much defence is enough? I was pleased to be asked to speak a few weeks ago at the ADM Northern Australia Defence Summit  in Darwin. I hadn’t been there since 2006, and it was interesting to see just how much the city had changed in that time. Clearly the resources boom has had an impact in our northernmost capital. I was asked to talk about the opportunities that might flow the way of northern Australia from future defence policy changes. It was an interesting topic that got me pondering on which of the historic and current elements of the defence presence in the north were likely to endure. Here’s the answer I came up with, and I’d be interested to hear from readers who agree (and even more interested to hear from those who don’t). Let’s start with some factors that don’t apply any more. There was a time when a military presence was required to assert sovereignty over a very sparsely populated area. That’s clearly untrue now—while the population still isn’t large, there’s no serious dispute over who owns it. Less obvious, but I think equally untrue, is the rationale that led to the ‘Defence of Australia’ (DOA) Policy and thence to the Army Presence in the North (APIN), which saw one of Army’s brigades moved to Darwin and the construction of three ‘bare bases’ that could be used by Air Force to mount operations in the ‘airsea gap’. My thesis is that the DOA construct was a product of entirely unrepresentative times, and has no relevance looking ahead. The origin of those notions can be traced back to the Guam Doctrine  annunciation by US President Nixon in 1969, which told American allies like Australia that we should be prepared to look after our own defence interests in our neighbourhood. Described by my colleague Mark Thomson  as a ‘get out of jail free card’, it meant that the ADF could be scaled back to a more locally-focused force—and defence spending could be pruned significantly. But it meant that a fiction had to be invented to provide a coherent supporting narrative. Thus we set off down the road that led to APIN and bare bases that, to this day, nobody seems to have a clear idea of how to provision and actually use. And it led to silliness such as a series of Kangaroo exercises which saw significant army forces patrolling the barren north looking for small groups of fictitious Kamarian infiltrators—though it was never satisfactorily explained what those infiltrators were doing, other than presumably looking for shade . It’s expensive keeping forces well away from the major population centres, and thus the economies of scale that come with large cities. So it’s not surprising that there’s been some winding back of APIN, with the relocation of 7RAR from Darwin to Adelaide. That said, the $650 million price tag for the move means that it’ll be decades before the move breaks even. As Mark Thomson and I noted a couple of years ago , moving the ADF is an expensive proposition, and there has to be a compelling reason based on operational effectiveness to do it. But that doesn’t mean that the ADF presence in the north will remain at present levels in perpetuity. There’s a school of thought that an increased ADF presence is needed to secure the substantial resources industry located on or just offshore from northern Australian territory. I’m not convinced of that, but money speaks loudly and the resources sector certainly produces lots of that, so some increased ADF activity up there is a plausible outcome. A much more compelling reason is a strategic fundamental that was obvious in the 1940s, but has been overlooked in the ensuing decades. When there’s a major Asian power capable of contesting western naval power in North Asia, Australia’s geography becomes a very powerful thing. Graeme Dobell’s recent piece on MacArthur and 1942  gets it right. Sitting at the confluence of two major oceans and the vital trade routes of Southeast Asia, American power projection into that contested space benefits enormously from being able to stage from Australia. In the 1940s, it was an expansionist Japan. Now it’s China and its anti-access capabilities providing the contest further north. That’s why we’re seeing the United States establishing a presence in Australia through it’s rotational Marine Corps presence in Darwin, with increased air and probably naval assets to follow. And if Australia decides to pursue a closer cooperative approach with American forces, there’ll be plenty of reason for the ADF to build its northern presence over time as well. So forget the DOA and Kamarians. After six decades of an unnatural order, we’re back to an Asia where the United States needs us (and we might well decide that we need them even more). I think there’s a healthy future for defence investment in the north of Australia. And, incidentally, Mahan saw this coming . Andrew Davies  is senior analyst for defence capability and director of research at ASPI. Image courtesy of Department of Defence .